This is a story about a girl who may or may not have gone missing, because she may or may not have ever existed. It’s also the story of the small town who became famous because of her, no matter her existential state. But more than that, it’s a story of a family, who owns the small newspaper that writes about the search for the missing girl. It’s also the story of a reclusive yet extremely famous YA novelist, creator of much beloved and obsessed about fictional characters whose story is about to come to an end. These 4 story lines are all told by an 80+ year old obituary writer, who slowly weaves them into a collective whole that reveals some, but not all, of the answers to the questions in the book. I loved this book, its short chapters and compellingly garbled tales keeping me up late into the night as I told myself, “just a few more pages…”. But above all, I love that the reader is left with things to figure out for themselves—this ongoing trying to puzzle things out will make the book’s impact last long after the covers are shut. An 83-year-old obituary writer for a struggling, small-town newspaper finds herself embroiled in intrigue, stumbling onto the story of her career: a country girl has gone missing, perhaps whisked away by an itinerant aerial photographer. Or so it seems. It all could be simply a hoax, or a delusion, the child and child-thief invented from the desperate imagination of a lonely, lovelorn farm woman. 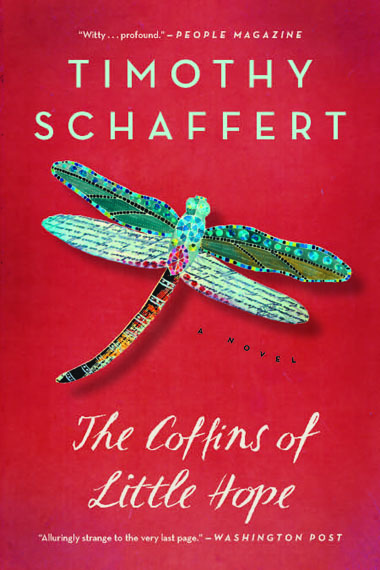 The fragility of childhood, the strength of family, and the powerful rumor mills of small, rural towns—The Coffins of Little Hope tells the story of characters caught in the intricately woven webs of myth, legend and deception. Esther Myles, an obituary writer in her eighties working for a struggling small-town newspaper, finds herself embroiled in intrigue, stumbling upon the story of her career as the story of the girl reaches far and wide, igniting controversy, attracting curiosity-seekers from all over the country to this dying rural town. And what do the gothic tales of Miranda and Desiree, the storybook sisters of Muscatine’s series of novels, play in this town’s survival and in the enduring mystery of Lenore? This began not as a book but as an obit of a kind for a little girl who up and went missing one simple summer day. On this girl we pinned all hopes of our dying town’s salvation. The longer we went without seeing her even once, the more and more dependent upon her we grew. She became our leading industry, her sudden nothingness a valuable export, and we considered changing the name of our town to hers; we would live in the town of Lenore. Is it any wonder that we refused to give up hope despite all the signs that she’d never existed, that she’d never been anybody—never, not even before she supposedly vanished? By the time Daisy, the mother of that vaporous Lenore, finally called me to her farmhouse, after all the weeks of bickering and debate that enlivened our town yet ruined its soul, after most of the events of this book had passed, no one anywhere was any longer waiting for word of Lenore’s death. For some of us, Lenore was nothing but a captivating hoax, while for others, she was a grim tragedy, a mystery cynically left unsolved. You were either one of the ones who truly believed in Lenore or you were one of the ones who believed in the same way you believe in the trickling stigmata of a plastic Virgin, with a trust in magic and miracle mostly for the thrill of it. Or you were one of the ones with no faith at all. Those were the ones, the ones with disbelief, who benefited the most, who made the most money on the sad pilgrims who skulked in and out of our town. Some of you may say I’m just as bad as the worst of the people who’ve exploited the summer, fall, and winter of Lenore, that I’ve played this story like an accordion for the purposes of melodrama, squeezing and stretching, inflating and deflating scenes and events at will. But I stand behind all the truths in this story of deception. Maybe because I’ve so long looked so old, even when I was relatively young, that people feel they can be revealing around me, that they can unbutton their lips and let slip intimate facts and trust that I have the maturity to keep my mouth shut.